Why do developers need structured logging? The traditional log systems store log files as unstructured text data, which makes it harder to query them and infer useful information from the results. Parsing logs before the actual troubleshooting requires a great deal of time. In a distributed stack environment, logs are generated by multiple applications across different systems. Developers struggle to put these pieces together, get a coherent overview, and understand the context of various events that took place. In the absence of integrated visual charts, graphs and dashboards, it is difficult to analyze unstructured logs to find hidden patterns and insights. Using open-source tools to visualize log data requires complex integrations, which further delay analysis. SolarWinds® Loggly® enables centralized log management by unifying logs emerging from multiple applications running across the distributed systems. Loggly streamlines log messages by aligning them in a consistent message format while preserving semantic information. The agentless architecture allows you to send your logs to Loggly without any hassle. Loggly automatically parses many types of data including Apache, Nginx, JSON, and many more. Besides automated parsing, Loggly also provides Derived Fields to extract customized information from free-form log messages. And uniform log messages allow you to use advanced search features like faceted search and advanced filters for better diagnosis instantly. 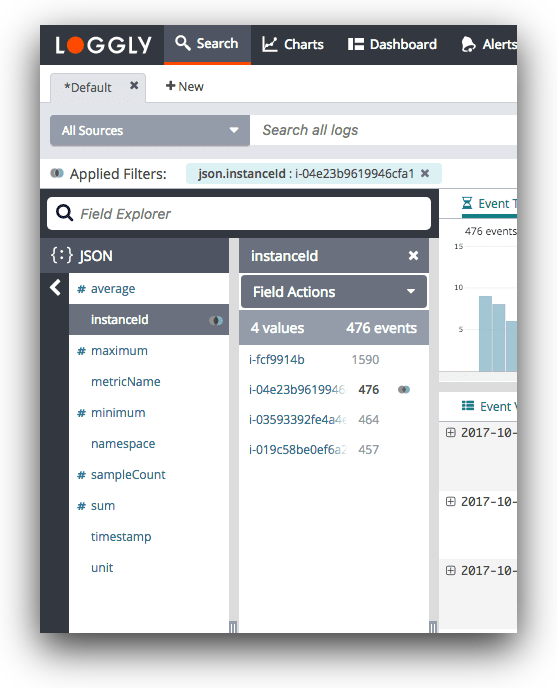 Loggly automatically parses incoming logs and further represents your log data in a structured manner with the help of dynamic field explorer functionality. With this highly interactive explorer, you can view the structured summary of logs with just few clicks. You can easily browse through the structured logs in real-time rather than typing multiple search queries or relying on guesswork to troubleshoot errors. The Loggly surround search capability helps you easily correlate logs by viewing events that occurred around any critical event across the distributed stack, with a single click. Troubleshoot faster with Live Tail, the feature that lets you see logs across the stack in real time and focus on critical logs. Loggly supports better log analysis and monitoring with advanced data visualization. Integrated interactive charts, graphs, and dashboards help you discover hidden data patterns, spot trends, and track SLA compliances. You can incorporate charts and graphs with data from multiple sources to derive valuable insights from your structured logs. Loggly also helps your team collaborate by providing shareable dashboards, thereby adding more value to your structured logging. To further promote collaboration in a distributed environment for improved monitoring, Loggly allows you to download dashboards as a PNG image. You can then share this image with your team via email or other tools, like Slack.